Air pollution, soil erosion and desertification, agricultural inefficiency, forest destruction, water pollution, and water depletion are only some of the environmental problems we face today. Our planet may become unlivable in the foreseeable future unless our habits change. Perhaps there's something inherently wrong about the way we see the earth and our place in it? 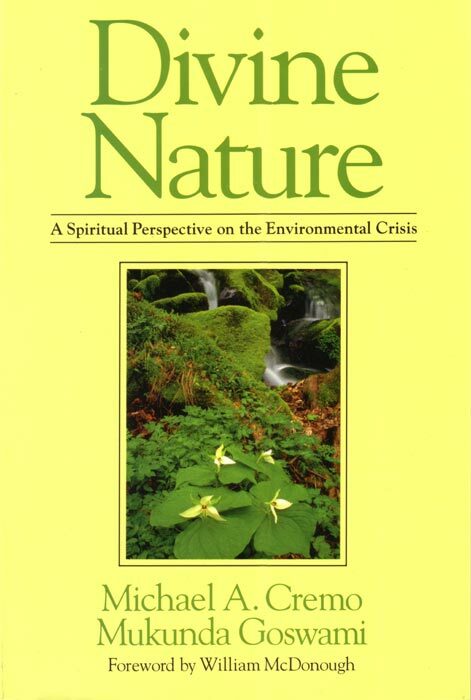 "This book, Divine Nature, reminds us that we must learn again to live within the laws of nature and find the means of expressing our human intention as interdependent actors, aware that we are at the mercy of sacred forces larger than ourselves, and aware also that we must obey the laws governing these forces in order to honor the sacred in each other, and in all things. It instructs us correctly: we must come to peace with and accept our place in the natural world in order to enjoy the spirit of belonging to the earth firsthand." "Does a highly spiritual tradition like Krishna consciousness concern itself with concrete problems of this world? Do the teachings have a significant environmental impact? Divine Nature is a clear, even eloquent "yes" answer to these questions. The chapter on Meat and the Environment is the best succinct statement I have read on the environmental impact of meat consumption. But Divine Nature deftly weaves this concrete factual material into a worldview which includes history, scientific theory, and the metaphysics of karma. The implications of diet are far-reaching. Divine Nature is a must for professors of religion like myself and for students like mine. It shows us that the apparently abstract and ethereal realm of spirituality bears upon the environment in a quite positive and practical way."